The most fuel efficient tire in the Hercules passenger lineup with LRR tread compounding (low rolling resistance). Computer optimized tread design that greatly reduces road noise and vibrations. 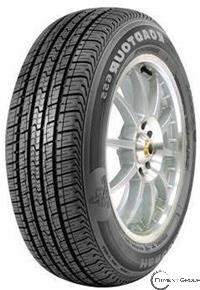 Touring tread design and siping result in superior all-season performance. Nylon overwrap added in the green tire aids in the stability and longevity of the Roadtour655. Profile design and center-rib result in crisp steering response and enhance overall road handling characteristics.